Filesharing is made primarily responsible for the decline in sales in the phonographic industry, especially in the CD segment (see the current IFPI Digital Music Report). However, serious research on filesharing behavior (see Huygen et al 2009, Andersen/Frenz 2007, Oberholzer-Gee/Strumpf 2007 (working-paper March 2004), Blackburn 2004) shows that filesharing use does not necessarily have a negative impact on physical and digital sales. But if this is not the case, then there must be other causes for the now decade-long recession. In the following I would like to discuss alternative explanations for the recession in the music industry and try to substantiate them empirically. But first the facts: For 2008 the International Federation of Phonographic Industry (IFPI) reported continued reductions of both unit sales and turnover figures. Despite increases in the online and mobile digital music segement, the U.S. trade value decreased by 18.6% compared to 2007. The European market shrank by 6.3% and Latin America by 4.7%. Only the Asian market has seen a slight increase of 1.0%. Overall, however, the worldwide sales of music products were by 8.3% less in 2008 than in the previous year. Considering only physical sales, we obtain an even more dismal picture: United States: -31.2%, Europe: -11.3%, Asia: ‑4.9%, and Latin America: -10.3% from 2007 to 2008. And that’s just the last year of a whole series of bad fiscal years. In the meantime, some national music industry bodies reported figures for 2009. Argentine: a drop of 14.9% in units sold; Canada: physical unit sales fell 6.7%; France: physical sales dropped 3.4% while digital sales also dropped 1.9% due to a 41% drop in ringtone sales; Italy: overall industry turnover ‑19.0%; Japan: physical sales dropped 27%; The Netherlands: the music market is down 4.6% in value. Only two markets show a positive trend in sales figures. In Sweden overall music sales were up 10.2% in 2009, and in Australia the wholesale revenue from physical as well as digital products show a plus 4.8%. Affected particularly severely has been the CD segment, which is still the industry’s main sales driver, even though its influence is waning (see this “The CD is dead! Long live the music download?”). 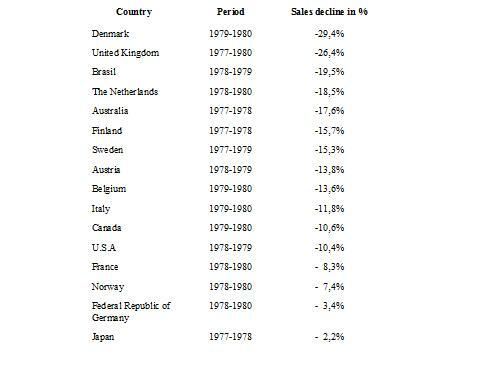 In 2008, the world’s largest markets – the U.S., Japan, Britain, Germany, and France – showed declines in sales in 2008 (in million units) between 34.9% and 59.2% compared to the current best years. The comparison of record sales by format from 1977 to 2000 shows that the music cassette dominated the period from 1984 to 1994. In the same period, the vinyl record fell into economic irrelevance. Long-play vinyl formats reached their zenith in 1981 with 1.1 billion sold worldwide. In 1984, the same number of vinyl LPs and music cassettes – 800 million units – were sold. At this point – in the second year after its launch – the CD accounted only for 20 million sold copies worldwide. In the following years, however, the CD-segment began to multiply. In 1989, more CDs were sold worldwide (600 million) than LPs (400 million). However, the music cassette was the market-leader with a historical high of 1.5 billion units sold. In 1993, the CD (1.42 billion) outperformed music cassettes (1.38 billion) and became almost the sole source of sales in the market. If we add to this picture the sales of single-formats, a process of transformation is revealed as well, which started in the first half of the 1980s. In 1983, after years of stagnation, 27.5% more singles were sold than the year before – this time a historic high of 800 million units. In subsequent years the singles’ sales sharply slumped despite the CD single. 1993, after the CD had taken the leadership position in the market, only 410 million singles were sold. The single market had almost halved. But the bottom of the recession for the single-format was still not reached. Ten years later, in 2003, just over 233 million units sold were singles – a decrease of 70.9% (!) compared to 1983. What happened? The overall market for recorded music had become a market for long-play formats. This reflects a business strategy that was pursued mainly by the major record companies since the late 1960s. The single was turned into a test market for yet unknown, non-established artists. Only when the first and perhaps also the second single sold quite well, an album was brought forward for the music consumers because of its good price-performance ratio compared to the single. Especially with the established acts, single-sales played virtually no role anymore. The album had become – economically and artistically – state-of-the-art. However, the long play format – in spite of many concept albums – has the disadvantage that it contained only 1 to 3 tracks that were ultimately of interest for the buyer. The rest was considered dispensable filler. In addition, the industry stimulated the hit compilations market, which increased the flood of album productions further. The shift from single- to long-play formats went hand in hand with a strategic reorientation, which had its roots in the second half of the 1960s: market segmentation. Previously, only 3-4 market segments existed, such as, for example, in the U.S. in the “white” pop charts, the “black” R & B charts, and perhaps the classical music segment. The labels and above all the majors had realized that they could increase the profits by a target group-specific supply policy. New market segments such as Country & Western, folk, and many types of rock music – Rock, Psychodelic Rock, Art Rock, Jazz Rock, Hard Rock, Heavy Metal etc – were established. This segmentation strategy certainly met a landscape of differentiated musical tastes, and music consumers welcomed this. In parallel development, the recorded music market was booming due to the CD. The sharp rise in sales and revenue figures, however, masked the basic problem of a highly differentiated genre-landscape, which had been fragmented by further innovations by the Indies. But that did not matter as long as the established business model worked. But the ability to offer music tracks online over the Internet rendered this business model obsolete. The figures show that in recent years the album market turned back into a single market. While in 2008 global CD sales had already declined below the level of 1993, single-sales, due to exploding digital downloads, prospered while sales of digital albums grew slowly. Since 2004, when digital sales were reported for the first time, single sales more than quadrupled (!) to 1.5 billion units, whereas the amount of digital albums sold in the same year only comes to 113 million units. If we now compare all long-play formats (excluding music videos) with the single formats, we can see that as many long-play products (1.51 billion units) were sold as single products (1.49 billion units). It is clear that you cannot earn the same revenue with the same number of single units than with long-play units sold. Therefore the drop in sales is due to the conversion of an album to a single market. File-sharing can be interpreted in this context not as a cause but as a symptom of the digital revolution in the music industry. However, it should not be overlooked that the current developments (a cultural paradigm shift in the music industry and not only there) go well beyond the question of file-sharing or single- vs. album market conversion. Thus, one should not commit the error to replace one simplified explanation (blame file-sharing for the decline in record sales) with another (pointing to the transformation of the album- to a single market), because the paradigm shift is much more complex than the suggested explanations (see Tschmuck 2006). However, the “single market”-thesis contributes a much better explanation for the declining sales in the recording industry than the “filesharing” thesis. And there is empirical evidence that file-sharing does not necessarily have a negative impact on recorded music sales. A recent Dutch study just published (see Huygen et al 2009), as well as the widely discussed study by Oberholzer-Gee/Strumpf (2004 and 2007) and the doctoral thesis of Blackburn (2004), suggest this conclusion. Blackburn’s findings that new and unknown artists benefit from the sampling effect, while star-acts suffer from filesharing, also fits into the picture. Whereas superstars have benefited in the past from selling albums, the emerging track-culture on the Internet put them under economic pressure. In contrast, newcomers can take advantage of the emerging single market and the highly fragmented and diverse genre-landscape. To sum up, the expanding market from the 1960s to the late 1970s was based on a market segmentation strategy by establishing new music genres and long-play products as a key source of sales. But this led to smaller and less profitable market segments and subsequently to declining sales and revenues in the late 1970s. With the launch of the CD in 1982/83, the major companies focused on superstar acts, and revenues soared again in unprecedented heights in the 1980s and 1990s. One must not oversee that the CD-boom was mainly fueled by the re-release of repertoire still existing on vinyl. The superstar-orientation as well as the CD format ensured that the album became the main source of sales in the industry. The single lost its importance and finally assumed only the roll of a test market. When these structures were confronted with the track-culture of the Internet, the album market turned once again into a less economically viable single market and caused the slump in sales of the last decade. The figures also show that the single-format, thanks to strong sales of digital downloads, is on the rise and already have matched long play-sales on a pure per unit basis. The labels’ task is now to find again a model in which music in bundled form increases not only the revenues and profits but also the music consumers’ benefits. However, this is more difficult to achieve under the prevailing conditions than the increase of mobile and online music sales based on single-tracks. If, in addition, the insight prevails that file-sharing is in fact not the cause but merely a side-effect of the current transitional phase and that it actualy represents a promotional opportunity for thus far unknown acts, then sales might increase again that thus help overcome the recession in the phonographic industry. Andersen, Birgitte and Marion Frenz, 2007, The Impact of Music Downloads and P2P File-Sharing on the Purchase of Music: A Study for Industry Canada. University of London Working Paper. Blackburn, David, 2004, On-line Piracy and Recorded Music Sales. Draft of a doctoral thesis in December 2004. Harvard University. Gronow, Pekka, 1983, “The Record Industry: The Growth of a Mass Medium.” Popular Music 3: 53-75. Huygen, Annelies et al., 2009, Ups and Downs. Economic and Cultural Effects of File Sharing on Music, Film and Games. Report commissioned by the Ministries of Education, Culture and Science, Economic Affairs and Justice of the The Netherlands. International Federation of the Phonographic Industry (IFPI), Reports for the years 1973 to 2008. London: IFPI. 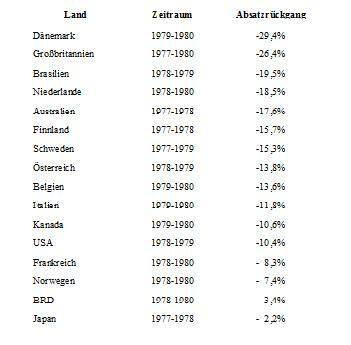 Oberholzer-Gee, Felix and Koleman Strumpf, 2004, The Effect of File Sharing on Record Sales. An Empirical Analysis. Harvard Business School Working Papers, March 2004. Oberholzer-Gee, Felix and Koleman Strumpf, 2007, “The Effect of File Sharing on Record Sales: An Empirical Analysis.” Journal of Political Economy 115(1): 1-42. Tschmuck, Peter, 2006, Creativity and Innovation in the Music Industry. Berlin etc. : Springer. First off let me just say that I love the concept of this blog, even though to the average reader this may come off as a bit of a dry topic. #1) The introduction of SoundScan in 1989. Prior to SoundScan being introduced as the central tabulation method for actual physical sales, stores could really say whatever total they wanted, and more importantly so could labels and managers. If you read any of the books which have been written about the shady practices of the record labels over the years – I strongly recommend Hit Men by Frederic Dannen (Amazon.com link) – you find out that not only did many labels inflate their actual sales numbers, they would also sell off huge amounts of albums for far less than the actual price in order to gain chart status quickly. This was happening as recently as the mid-80s. SoundScan’s introduction was famously responsible for NWA’s “Straight Outta Compton” achieving top 5 chart success on Billboard, usurping Paula Abdul who at the time was consistently within the top 5. 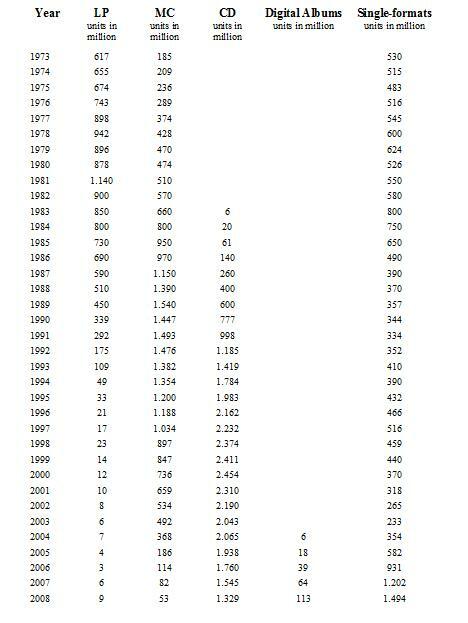 [proof] SoundScan’s numbers didn’t become the standard for Billboard until 1991, but this sudden shift in 1989 is significant because it established genuine sales numbers versus made-up figures as the method for reporting sales. I can tell you based on my own anecdotal evidence that people very much did still want to be able to purchase LP versions of recordings in the mid-to-late 80’s, but unfortunately for them most of the major labels made a firm decision to stop pressing high quantities of vinyl starting in 1987. Worse: the pressings they did make were largely of worse and worse quality, resulting in high return rates of this product. This was due to the centralization of pressing facilities, which caused many high-volume LP pressing plants to go out of business. Labels love to point to this as an “obvious” sign of the dominance of CD’s – and don’t get me wrong, CD’s were still popular – but this forced limitation of available LP product would most definitely have an effect on overall sales numbers. I personally had to handle many, many complaints regarding this issue during the aforementioned time period. Many labels, notably EMI and Sony, began implementing DRM and “copy control” technology on CD’s during this time period. Sony famously included DRM software which would rootkit a user’s Windows PC, and they later had to offer a settlement to anyone who purchased CD’s with this technology. Anecdotally I can tell you that most people I know who still were in a supportive position of artists on major labels became extremely vocal over this particular move, and I would have to imagine that over time this would definitely impact total sales year over year. Many music forums encouraged consumers to boycott any product which featured this technology, no matter who the artist was or which label released it. Self explanatory. Many consumers saved up to purchase this game ($60 a copy where I live) and completely ignored most other forms of consumable entertainment. I feel certain that the current lack of certain artists on iTunes and other services is most definitely contributing to a further slide in sales. Seriously: the Beatles reissues aren’t available via iTunes? Why? Not that I will personally buy them, but I know of very few people who want to purchase another physical CD, even if the mastering is ridiculously good. Of course they’ll go to other means to find this material, and rest assured they are. Thank you for your very valuable contribution and I think you correctly mentioned important additional factors that can explain the slump in physical sales in the last decade. It is a much more complex picture that cannot be interpreted by simply causality as the industry’s “filesharing-hypothesis” suggests. Therefore we need much more research on that issue in order to find a sufficient explanation. Thanx for your kind feedback, and my paper was prepared on June 8, 2010. Great to see it evidenced in such a way. Although not as grounds in facts and figures as your above points, I also feel that the shift from album market to a singles market is in part the major labels’ fault… Too much focus on the hit single without the quality of songs throughout artists’ albums fueled this IMHO. I’m not sure how this could be evidenced but as per Adam’s comment, this is my personal experience. Lovelifefashionista – do we get to read your final paper? I do hope so. best analysis of recent years!!! A fine and interesting analysis you’re doing here. Indeed. Maybe you can help me on this. I understand from various sources that 80% of the overall music production is nowadays released on indie imprints, would you know where can be found comprehensives researches focusing on the indie music market ? More precisely the evolution in recent years of production & sales of indie recorded material, and the weight of physical releases (vinyl / CDs) in the indie market and also studies on indie music consumers. If you have an idea on how & where I can get litterature and stats on these subjects, that would be just great. Your use of data is interesting but to do a proper analysis of the whole crisis you need to consider other factors. The single at the time that the compact disc became the sound carrier was not commercially feasible. To replicate and package a CD album or a CD single had the same cost. During the time vinyl was the format (70’s and 80’s) artist and labels were more repertoire oriented something that started to decline during the 90’s. This was a result of a change on management on labels (less A&R more business affairs and financial sector) input. Not all artist have the knowledge to make the right decision when it comes to repertoire and production (that’s why since the 90’s we ended having few good albums and a lot of “one hit song” albums). The same management that completely disregarded A&R was the same that choose (mostly during the 00’s) to completely neglect small accounts (record stores) and benefit mass merchants with huge discounts to move volume. As a result the small record store or the catalog store became not viable and today the record store is something from the past. The same management thought the future is to sell digitally !!! But none of the majors took the time to create their own interface to sell downloads, basically because of laziness, and did not take in consideration that at that time the internet was reaching less than 25% of the consumers and that a lot of people (still today) do not trust the internet to buy using credit card information. So instead of being at the mercy of the mass merchants now they are at the mercy of Apple/Itunes that only cares about selling hardware (Ipod, Itouch, Iphone, Ipad, and whate I the will create in the future). The same management did not see that the digital market was basically becoming the part of the market lost since the late 80’s: the singles market but they quickly buried the CD format as not viable without having a replacement format. Today if my kids (19-23) want to buy music they are going to get it faster (and free) on the internet and they do not have to wait for a street date and/or the availability on a store. Major artists do not care about “selling music” they already understood that a track is another promotional tool and the name of the game is merchandising and shows. The equation is clear no stores no sales, no sales no music business. Maybe the commercialization of music will become a thing of the past ??? I’m sorry, but ASKING people what their habits are is not, in ANY WAY SHAPE OR FORM, ’empirical research’. Empirical research would be analyzing their download and music buying patterns without prior knowledge, ie. so they don’t consciously or subconsciously modify their behaviour in relation to being studied. … by that logic the sales of CDs should be close to infinity by this point in time. Why do people never do the Math? Fascinating article! There’s one topic that I find is rarely addressed in discussions of profitability in the music industry. This is the question of the cost of goods sold. The manufacturing and distribution of physical LPs, cassettes, and CDs requires significant upfront investment. I make and sell music CDs on a small scale. It costs me (for example) $3 per CD to manufacture, plus $2 per CD to ship. If I sold many thousands, these costs would go down, but I’d also incur other costs. So let’s just say that each physical CD costs me $5 to manufacture and send to the retailer. Plus I send hundreds of CDs for free to radio stations. These cost $5 each too. In contrast, an MP3 file costs me nothing to send to a retailer or to the consumer. Zero! An MP3 file can be replicated infinitely at no cost! So any record company or artist who sells MP3s has eliminated a huge cost center, and takes home much more in profits. Which would any label rather sell – 50,000 digital CDs, or 50,000 physical CDs? From a standpoint of profitability, it’s no contest.